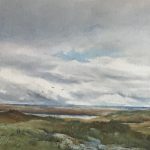 David West, RSW (1868–1936) was a watercolour painter of land, sea and sky. He was born on 12 November 1868 in Lossiemouth, the youngest of 12 children, and died 8 October 1936 in Glasgow. West was the son of Captain James West, commander of a sailing schooner. In 1883 West’s parents moved to Aberdeen and West attended Aberdeen grammar school for one year before going to sea with his father. During this time West found time to attend the Aberdeen Mechanics Institute and studied life drawing. While still working as a seaman he continued to paint culminating in his award of a gold medal at the Industry and Art Exhibition in Aberdeen in 1888. From 1889 to 1894, West exhibited at the Royal Scottish Academy and the Royal Academy in London. That five-year period saw him being accepted for the Royal Academy on successive years. When still in his twenties he had won for himself a wide reputation as a watercolour landscape painter. In 1892 he was commissioned by the Countess of Aberdeen to undertake a number of paintings for her. In 1893 West returned to Lossiemouth having spent a time traveling in the Netherlands to study Dutch art. West further travelled to the Klondyke and on his return four of his Klondike paintings were exhibited at the RSA. In 1903, the Society of Scottish Artists chose West to represent them at the Munich Exhibition. He was elected a Member of The Royal Scottish Society of Painters in Watercolour on 19 February 1908 and exhibited extensively at the Society’s Annual Exhibitions and also those of The Royal Glasgow Institute of Fine Arts. in 1935 West was elected as Vice-President of the RSW.